The Backup and Sync command is a great way to quickly synchronize a backup and a source folder or path. It will copy all files from the source that are new or newer than files in backup and then delete any files in the backup that no longer exist in the source folder. 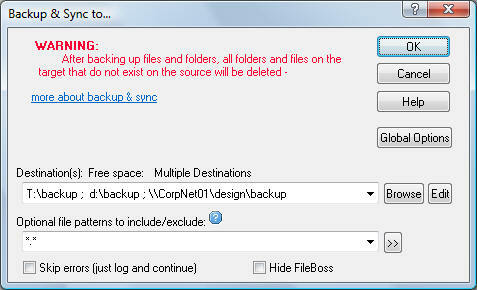 To only backup newer files without deleting any files from the backup folder use the Backup if Newer... command instead. And if you need more control check out the Compare, Merge & Prune routine for ultimate control. This action is applied to selected folders and files. If no folders or files have been selected the menu command will be unavailable. For folders all subfolders will automatically be backed up and synchronized too. Select Actions > Backup & Sync... from the main menu to open the Backup & Sync dialog as shown below. Enter the folder to which you want to sync the source folders. If you have used the dialog before you can select a previous destination from the drop down list box. To copy all files leave the Patterns field blank or enter and asterisk (*). Separate multiple patterns with semi-colons, commas or bar characters ( ; , | ) and precede patterns to be excluded with a minus sign (-). To prevent certain files from being copied enter their pattern(s) preceding each with a minus sign, e.g. -*.bak : -*.tmp : -~*. You can even combine files to copy and files to exclude, e.g. *.htm : *.html : *.css : -~* (note that order in which the file patterns are listed is not significant. Click the OK button and FileBoss will start the copying and display a progress window. Files will only be copied to the destination drive if they don't already exist there or the source file has been modified more recently than the destination file. You can optionally specify multiple file types and file patterns that should be copied. When the specification is present only files matching one of the specified patterns will be copied. For instance if *.htm : *.html ; *.css were specified then only files with those extensions would be copied. You can optionally specify multiple file types and file patterns that should not be copied. This can reduce the copy time and, sometimes more importantly, prevent your backup folder/drive becoming cluttered with intermediate and temporary files. And it can be combined with the option to specify which file should be copied, e.g. *.htm ; *.html ; *.css ; -~* will copy all files with the extensions htm, html and css unless the name begins with the tilde character (~) (a common way programs specify temporary files). If FileBoss can not copy a file it will give you the option of trying again (such as if you have to close a file that is in use) or just skip the file. Of course FileBoss will log any files that were skipped due to copy errors.